Mallik’s visit to Mumbai would’ve been pointless without a visit to the newly crowned UNESCO Heritage Site, Western Ghats, our beloved Sahyadaris. The destination this time around was a simple one, Sondai fort Trek. Close to the Morbe Lake Dam, near Karjat. This place had its own little lake dam, the Vaverle Lake Dam. The participants were Mallik’s rock climbing group buddies, Ritz, Farzheen, Sneha, Aditya, Meenaz. Me and Vj were just the climbing pals, the rocks seemed to shun us everytime we tried to overcome them. Mallik stayed overnite with me, and we picked up Vj early morning from Bandra Station. “Picked up”, yes, this was the 5-star trek of ours, a direct car commute to the base of the village. Others joined us at Kalanagar junction and we headed straight to Dutta Snacks, at the Panvel junction. A lazy lavish hour spent there having Batata Vada, chai, etc. My first trek with Farzheen, and the pit-stop at Dutta snacks made perfect sense. Another 15 minutes, and we were at the chowk junction. The rains were lashing hard, we thought that it was the first time this region including Mumbai was getting the heavy downpour of the season. At Sion junction, it was just 6.30am and it was already flooding. A left from Chowk/Karjat junction and few more minutes in the now decaying road conditions took us to Borgaon junction where we took a left and then wandered towards the Vaverle village, all in a car! 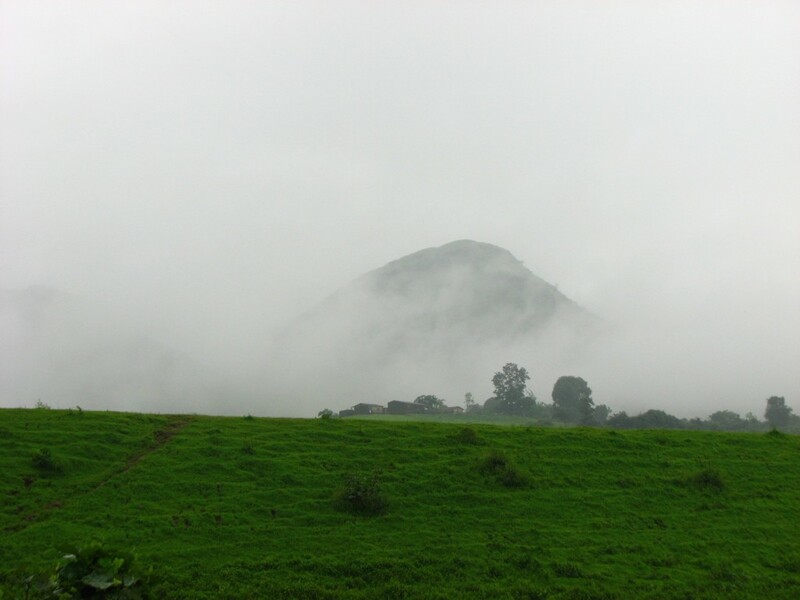 The country side was green, with every single green hue visible with the unsaturated grays of the hovering clouds simply dousing over the hills. The Sondai fort-hill was hidden behind the fluffy puffs. A small climb on top of what seemed like a wall opened up gasping landscape of a lake being nurtured by small hillocks on each side. The actual trek itself was a small 1 hr climb, mostly including trail walks. At the top we had some more food, thanks to Vj and Mallik’s bags which contained loads of tasty food and lots of Katchi beer ( छाछ ). At the base, the lake awaited us, I was the first to get into the water body, which welcomed me with warm water. The sight was simply irresistible for others, and soon everybody followed. Almost half-hour into the lake, and still all hesitated to move out. Mallik had already left. It was Mallik’s call for Maggi that put everybody in dilemma. A hot maggi on a rainy afternoon after a dip in the lake was something that nobody wanted to miss. We had maggi and other restover food in a small hut where another group was playing with an air gun and trying to determine whose pellet went longest in the pool! No wonder we miss out on so many of those shooting medals. Back at the car, we got into our dry wear, with RD Burman’s songs blasting through. On our way back we halted at a restaurant in Nerul for snacks and then back to our concrete and mortar.